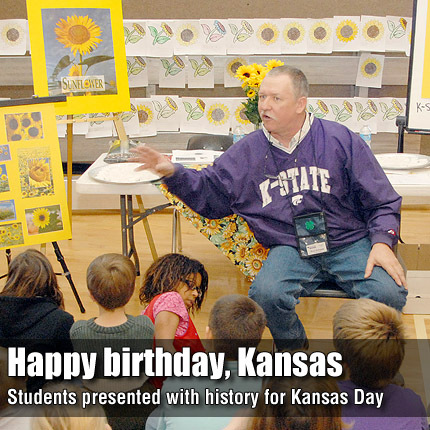 Lyndon and Burlingame students celebrated Kansas Day with presenters and activities Friday. Above, Rod Schaub, Frontier Extension District agriculture agent, discusses the Kansas state flower, with students in the Lyndon Elementary-Middle School gym. Students at Lyndon and Burlingame schools were treated to a host of historical presentations Friday in observance of Kansas’ 150th birthday. Presenters at either or both locations included Jan Kohler, with Osage County Farm Bureau’s farming display; Carl Manning, demonstrating an old time printing press; Rita Sharp, with Kansas art projects; Matt Miller, Channel 49, with Kansas Weather; Fran Richmond and Rod Shaub, K-State Frontier Research and Extension, discussing sunflowers; Eisenhower State Park rangers with animal skins and skulls; Lori Kuykendall, Osage County Conservation District, with the soil tunnel trailer; Ken Wilk, U.S. Army Corps of Engineers Melvern Lake, with early surveying on the prairie; the Emporia Zoo; Lyndon High School Principal Brad Marcotte, with his personal fossil collection; Lyndon Middle School seventh graders with a Kansas puzzle; Sarah Hitt, Lyndon Carnegie Library, with historical Lyndon documents; Jean Timm, Osage County Historical Society, re-enacting mountain men; David Flax with a Kansas farm crop matching game; Jim Rickets, Kansas pop bottle collector; Gene Quaney and Brian Droege; and additional volunteers at both locations.